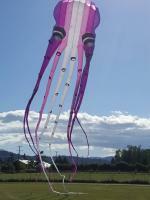 I am quite fascinated about inflatable arms of octopus kites. Side question: is there any simmilar type of kite? Inflatable, moving, rotating parts? Octopus is nothing unique and I would love to stay with what I like about octopus but be more unique. Have somebody tried making their own octopus kite? Before we dive into how, I would like to discuss if its worth it. I can buy 40$ 8m octopus from china , the price for ripstop nylon is about 30$ for1,5x10 m. So is it worth the effort? I am just starting with kites (have only one delta) thus have no ideo if I want 8m or larger octopus, but I like to make stuff, so I consider learning new thing and build it by myself. "Worth it" is always relative to the person and their circumstances. For some people it is, and other people it is not. 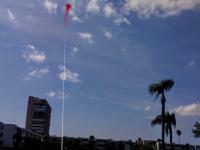 People build the kites, both from existing plans and from their own designs. People make all kinds of wild and wacky designs and show them off at kite shows and other events. Sometimes they fly well, sometimes they are best as decorations. If you have interest in doing it, and have the time and money for it, then go for it. 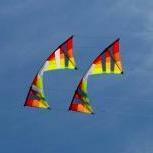 There are many web sites with kite plans that range from simple to advanced skill requirements. I personally wouldn't start out with an 8 meter project, but if you're comfortable with sewing large objects already then it might be an okay place to start. That's a lot of fabric to work with, especially if you've never built a kite before. You might instead start by making smaller (and simpler) sleds and foils to gain some experience. They would be easier to learn how to sew the kites and how to rig the bridles. Making your own can be very rewarding and frustrating , I'd start off making somthing smaller than an 8m puss If buying do your home work, some fly better than others and details on the smaller ones are generally not as good as on the larger ones. I bought the one in the picture it is around 90 feet, has 3d suckers and eyes. Smaller versions of this kite have flat eyes and suckers . you can also get squid and jelly fish. Good luck with this and happy shopping or sewing . Since I want to begin with something smaller than 30m octopus , already have a line and want to see the octopus live, then take inspiration from that (now I got no exp with kitemaking or inflanteble kites at all). Regarding the above points, buy is a clear choice.